But I'm no pro when it comes to feeding fussy kids. My own are pretty solid eaters, and I feel grateful for that at every meal. So when I got lucky enough to be booth neighbours with the lovely ladies of Real Food For Real Kids at this spring's Bump To Baby Show, I jumped on the chance to share some of their kid-tested recipes with you. My mama clients often complain about littles who refuse to eat veggies. And RFRK are basically experts at getting kids to eat real food...and getting them excited about it. Real Food For Real Kids provides whole-foods catered lunches and snacks to Toronto area schools and daycares. I was very excited to learn you can set up your own RFRK lunch club at your little ones' local public school if you can organize a minimum number of families. Food is served family-style, and includes omnivore & herbivore options. I'm excited to try to get a RFRK club started at our kiddos' school next fall. Anyway, Here's one of their little lunch eaters' favourite recipes, packed with veggies and perfect for a healthier summer picnic dessert. 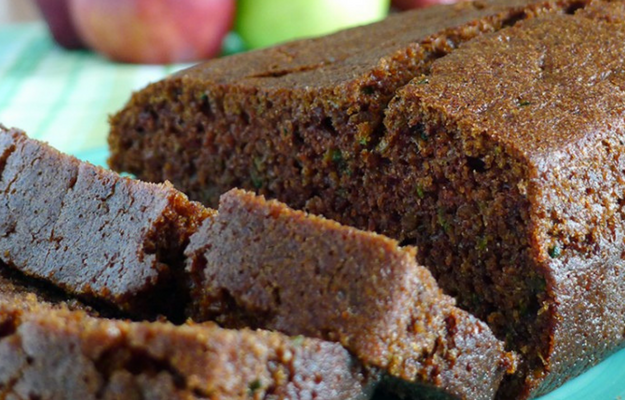 The chefs at RFRK warn you," Your kids may assume that this decadent loaf is chocolate cake. While we’d never encourage lying, we think it’s okay not to correct them all the time!" Build up all your willpower when baking this loaf. It tastes even better if you can save it for the next day. Grate the zucchini into a large bowl (everything is fair game: zucch shreds, juices, and end scraps). Add sugar, eggs, and oil, and mix with a wooden spoon until smooth. This will be your wet mix. In another bowl, whisk together your dry ingredients (your dry mix). Pour the wet mix over the dry mix and combine well with the wooden spoon. Pour batter into a greased and floured bread pan. Bake for about 45-60 min (until a toothpick inserted into the middle comes out dry). Allow it to cool completely inside the pan. Heads up: this loaf is ultra delicate and will break if you try to remove it while it’s still warm.